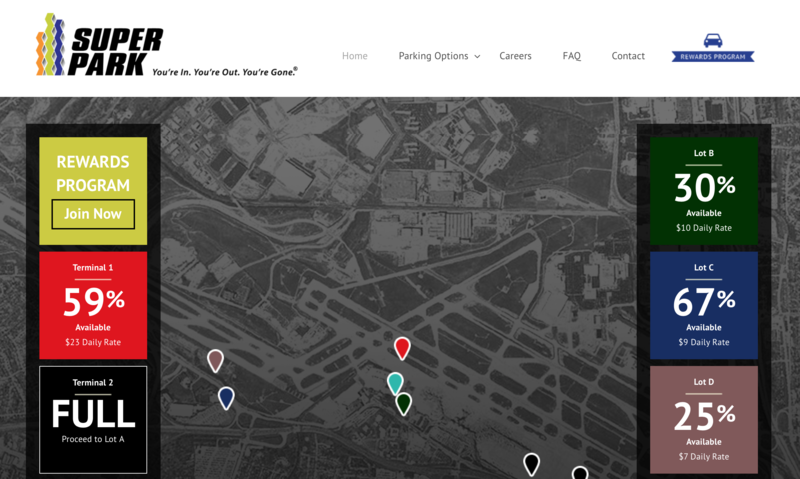 If you are flying out of Lambert St. Louis International Airport, more than likely you’re going to need to park your car somewhere you can trust. Super Park of St. Louis is one that jumps to your mind and is now boasting a fresh and modern website redesign thanks to St. Louis digital marketing agency, Caprola Squad. One of the features of the Super Park website is the real-time lot availability counters. On the home page of the website, visitors are able to see the percentage of each lot available as well as the pricing for each lot. Super Park has also included the availability percentage and pricing of the regular terminal lots at Terminals 1 and 2 alongside information for Lots A-E. The Caprola Squad was the first to create the concept for this innovative Lot Availability Counter in Missouri 4 years ago. By partnering with Automation & Management Consulting, LLC., the technology concept was able to become reality. Super Park of St. Louis’s website was redesigned by Caprola Squad in collaboration with Insite Advice where the focus was to create a modern, clean, and responsive design for website visitors. The design is seamless from mobile device to desktop, which creates a great user experience. When concepting a new website it’s imperative to not only know what’s trending in web design and development but also listen to the needs of the user as it relates to each product. Thanks to The Caprola Squad and partnering companies, Super Park now has a modern design with a user interface that gives visitors a real-time experience.